Johannesburg is a living ghost town with a population of nearly 200. 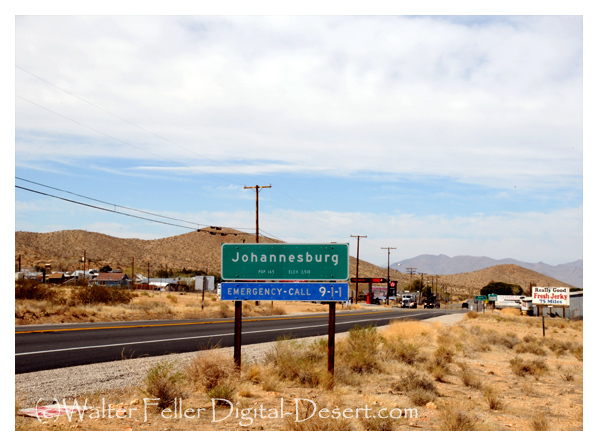 It is a small mining town and quiet stop along busy Highway 395 near Red Mountain, Randsburg and Atolia. Johannesburg at its height had a post office, two general stores, a real estate office, stationers and variety store, billiard-pool room, music hall, boarding houses, lunch counter, two laundries, two lumber yards, two livery stables, a barber shop, telegraph line with Mojave, and a telephone exchange with Randsburg. This greatly facilitated courting between the two towns, yet the party lines gave such unequalled privacy that two lovebirds found their conversations the subject of printed inquiries by the Randsburg Miner as to who had been making love to whom over the phone.